1 of 3 The night before, layer bacon between paper towels on a plate and microwave for 3 to 5 minutes, until crisp. Set aside. Heat oven to 350 degrees . 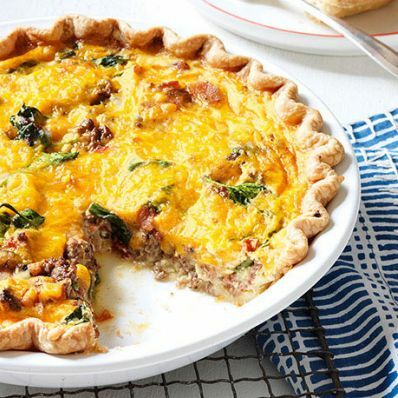 Fit crust into a 9-inch deep-dish pie plate and line crust with foil, pressing down. Bake at 350 degrees for 10 minutes. Remove foil and bake 15 minutes more, until crust holds its shape but small bubbles form. Cool on a wire rack, then cover and store at room temperature overnight. 2 of 3 Meanwhile, heat a large nonstick skillet over medium-high heat. Crumble in ground sirloin and add onion and Worcestershire sauce. Cook for 5 minutes. Stir in spinach, crumbled bacon and tomato. Cook for 3 minutes and add salt and pepper. Spoon into a lidded container, cover and refrigerate. 3 of 3 The next day, heat oven to 350 degrees . Break filling apart and spoon into piecrust. In a bowl, whisk together eggs, egg whites, milk, ketchup and mustard. Sprinkle cheese over filling in piecrust. Pour in egg mixture and transfer to oven. Bake at 350 degrees for 1 hour, 10 minutes, until a toothpick inserted in center comes out clean. Cover edge with foil if it's browning too quickly. Cool 10 minutes before slicing. Serve with salad alongside, if desired.